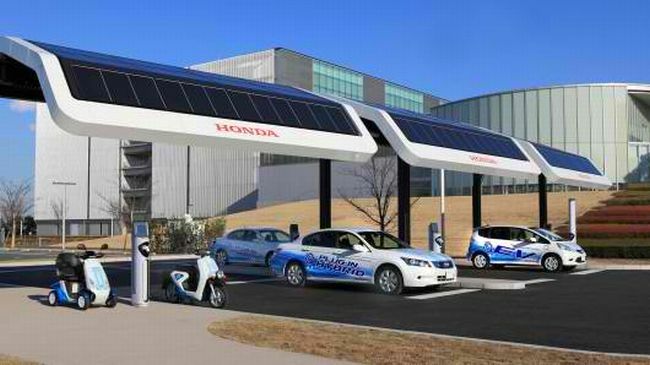 Thanks to a deal between the Japanese automotive giant and the local government of Saitama Prefecture, Honda’s Electric Vehicle Testing Program will be rolled out in three cities starting next year. The goal is to lay the foundations for a sustainable energy future, which requires that so much 20th century infrastructure be replaced. Since this cannot be done overnight, Honda is taking baby steps. Lots and lots of baby steps. This explains the prototype charging station pictured above. Note the different vehicles. The EVTP requires that several vehicles and scooters are tested to work out the kinks of developing full fledged charging infrastructure in cities around the world. In fact, the EVTP is also making its presence felt in Torrance, California, where it has partnered with Google (no surprise here) and Standofrd University. A hybrid Accord sedan is slated to be a test subject come 2012.